The AURA-8000 is rugged and high performance printer up to 220 mm per second. Its spill and dust-resistant top cover is thoughtful design for retailers to extend their business in much more places. Speedy printing makes the AURA-8000 do a good role as a payment receipt printer and an information printer for kitchen use. 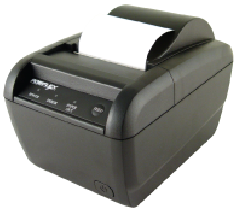 Additionally, the AURA-8000 features easy paper replacement and wall-mounted function. Interface: Serial Port (RS-232), Parallel, Lan or USB. Printing Speed: 220 mm /sec. LED Indicators:Power: Green, Error: Red, Paper Out: Red. Sensors: Hood Lock, Paper Near End, Paper Out, Overheat. International Character Set: 15 international character sets supported (Denmark1, Denmark2, Ex-Jugoslavia, France, Germany, Italy, Japan, Korea, Latin America, Norway, Spain, Spain2, Sweden, UK, USA.